Chrissy Satterfield writes for the vomit-inducing WorldNetDaily, a webzine that, in its deplorable, insatiable desire to entwine Christianity with right-wing politics, to offer Obama "birther" theories and encourage Christian victimhood persecution complexes, misses no opportunity to be an utter embarrassment to the One True Faith. They only manner in which Christians should be offensive is in those situations where people find the gospel to be offensive. Then we dust off our feet and move on. In no other circumstances should we go out of our way to be offensive. Chrissy Satterfied doesn’t get it. She editorialized about a story of Christian vandalism of an atheist billboard. 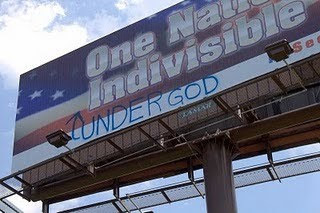 Someone spray-painted words "Under God" on a message of "One Nation Indivisible." In doing so she took the lowest of low-roads. She applauded it. She said it restored her hope. (What, we may ask, is the foundation of her hope if it can be restored by criminal mischief?). She named her article (OK maybe an editor named it, but if so he named it aptly) My Kind Of Vandals. Just when I start believing there is no hope for our country I get a little reminder from my God that all is not lost. It was reported June 29 that a billboard sign sponsored by a North Carolina atheist organization had been vandalized. The ad reads, "One Nation Indivisible." It seems someone didn't think the sign was an accurate depiction of our Pledge of Allegiance, so the vandals inserted "Under God" with spray paint – and I couldn't be more relieved. It's nice to know that I am not alone in my beliefs and that some people are still willing to stand on the right side of the truth. What a pinhead. Standing on the right side of the Christian truth is about presenting and living the gospel. And living the gospel never involves destroying someone's property. Duh. Why that’s might relative of you. I don’t know what New Testament Ms. Satterfeld reads. It must be the one where Paul went to Mars Hill and painted fish on all the statues. What did this group think would happen? They placed this controversial message on a billboard that just so happens to be on a street named after Rev. Billy Graham. Did they expect the response to be positive? No. I expect the response to be law-abiding. They probably didn't expect the response to be positive--that's why you put up provocative billboards--to elicit strong responses. And they succeeded. If this was a game, we ended up on the losing side, and Chrissy Satterfield is no more than a cheerleader for our ineptitude. I agree, mostly, with this post--as I said on another blog, "I agree putting a sign up on Billy Graham parkway is just 'begging for a response,' but no matter how tame or inoffensive the spray-painted slogan is, it's still a spray-painted slogan that makes people think of teenagers with too much time on their hands.' The Faith probably didn't end up looking too good here. C) An act Christians should in any way imitate? Yes, yes, and yes. Christ was the real high priest, and as he said this was his father’s house. It was his right and perhaps even his duty to purify the temple. Many activities that were lawful outside the temple were nevertheless desecrations inside the temple. And most likely the enterprises were not operating lawfully—i.e., cheating and/or involved in kickbacks to the temple priests—hence the charge that they were thieves. So of course it was a) legal and b) moral. Should we c) imitate Christ? Yes, we should do exactly the same thing; we should purify our temples, i.e., our bodies. I have trouble believing that the answer to A (and even to B and C) is really that straightforward and easy. And arguing that Christ taking a whip to moneychangers was legal - I guess "ultimately legal" - because of 1) who He was, 2) what He wanted, and 3) assertions about the lawful behavior of the moneychangers/priests really seems to open up the exact can of worms you forcefully put a lid on in your post. But, thanks for your answers. I won't pretend I have a perfect reply to this either.